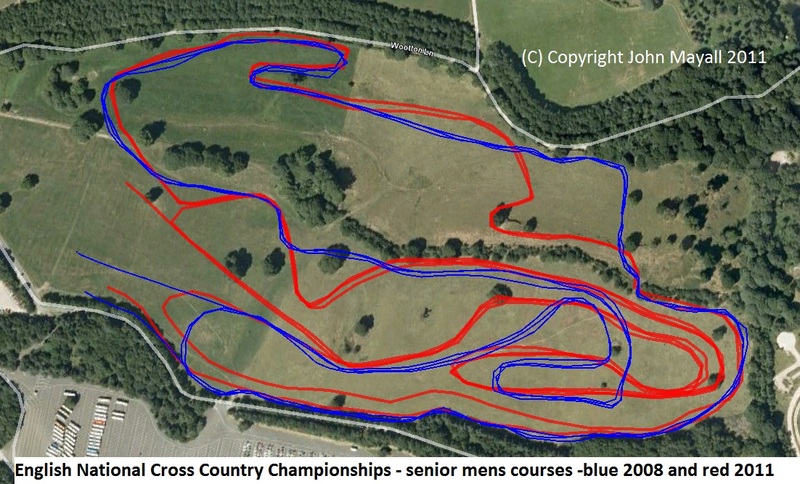 This was the 2008 running of the premier race in English Cross Country - 'the Nationals'. We didn't really know what to expect from this new course. The parking at Alton Towers was excellent and free. There were plenty of loos (although a bit smelly!) and several hamburger stands. The event itself ran like clockwork - a credit to the organisers. The field was top quality. There aren't many races where sub-30 minute 10K runners finish nearly 30th. The course was fast, undulating and with one major climb of about 100 ft, followed by a more gradual 50 ft climb. It doesn't sound much but this was a lung buster of a course. Ladies ran 2 laps and men 3. The men's course was about 1 mile short of the advertised 12km. There was little mud by Manchester standards. The openness of the course meant that as a spectator you could watch great swathes of the race from the higher ground. 2011 Update - the course was the muddiest XC race I have ever encountered. The surroundings were a mudbath too (see pictures below). As a result of St Johns Ambulance being very busy, the race starts were put back and the courses shortened (men from 12km to 10km, one short and two long laps with 2 climbs) to ensure the event finished in daylight. The event had the scale and feel of a big National event and everyone I spoke to absolutley loved it (in a masochistic kind of way). 14 January 2010 Copyright John Mayall 2008.